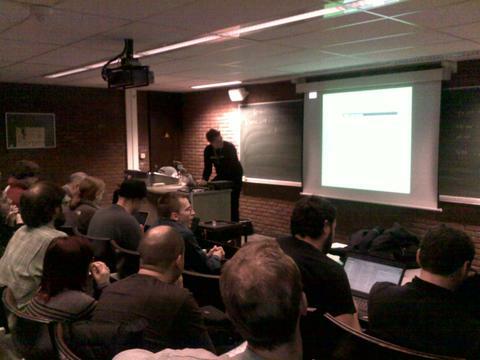 In his talk about Autotools at the FOSDEM GNU Dev Room, Ralf Wildenheus mentioned an autoconf option that I wasn’t aware of. It’s the “-C” option and it enables caching, which speeds up multiple runs of a ./configure script enormously. Caching used to be the default up to about 10 years ago, but was turned off as the cache gets out of sync with the system if new packages are installed. Also it really only benefits developers, as end-users typically only need to run ./configure once. In the 1990′s I got used to caching being enabled by default and when it was turned off I never noticed the change — except that somehow running ./configure while developing seemed a lot slower in the past ten years! Thanks to Ralf for pointing out this option as I am now using -C all the time. 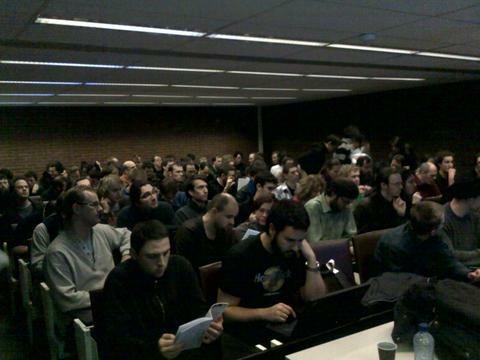 The GNU dev room at FOSDEM 2011 was great, the room had 100 seats and every talk was packed out with people standing at the sides. Dynamic hacking with Guile by Andy Wingo on the new release of Guile 2.0 and hacking a twitter clone (“Peeple”) live in 15 minutes using Guile’s new web framework – amazing,. GNU Autotools by Ralf Wildenhues with lots of useful tips for autoconf and automake. GNU Network Security Labyrinth by Simon Josefsson, a nice tutorial on how different security protocols have developed over time, in order to solve the problems with earlier attempts. GNU recutils: your data in plain text by Jose E. Marchesi, tools to work with your data on the command-line. Power, Freedom, Software. Why we need to divide and re-conquer our systems by Karsten Gerloff. Non-free software advertisement – presented by your government by Matthias Kirschner, about the successful PDFreaders.org campaign. Thanks to José and Andy for organising the day, it was a great set of topics. Karsten Gerloff talking about freedom and the cloud.